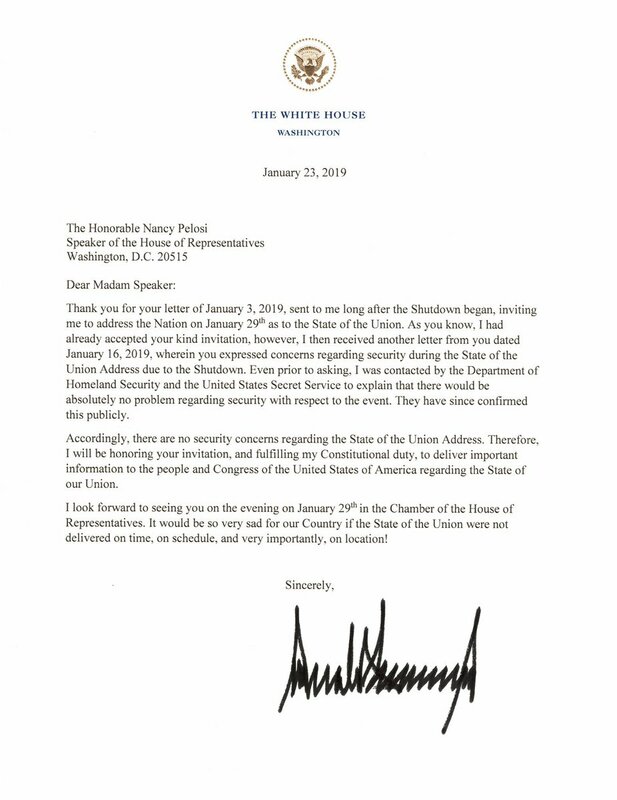 President Trump sent a letter to Nancy Pelosi, honoring her prior invitation for the SOTU speech on Jan 29. Nancy then insisted that there be no SOTU if the government is still shut down. See what she’s doing here? Since she and her obstructionist democrat friends are in control of the House, she can keep it closed past the SOTU date and try to keep POTUS from telling the truth about the serious security threat we’re facing at the border. The problem with Nancy is, well, I’m not sure if she’s very smart. She’s been 2 or 3 steps behind Trump on every move. I’m guessing that’s why the gov’t is still shut down – she’s trying to figure out what Trump has already done. She’ll never catch up to what he’s actually doing. See, President Trump has had a backup plan from day 1, probably many backup plans. 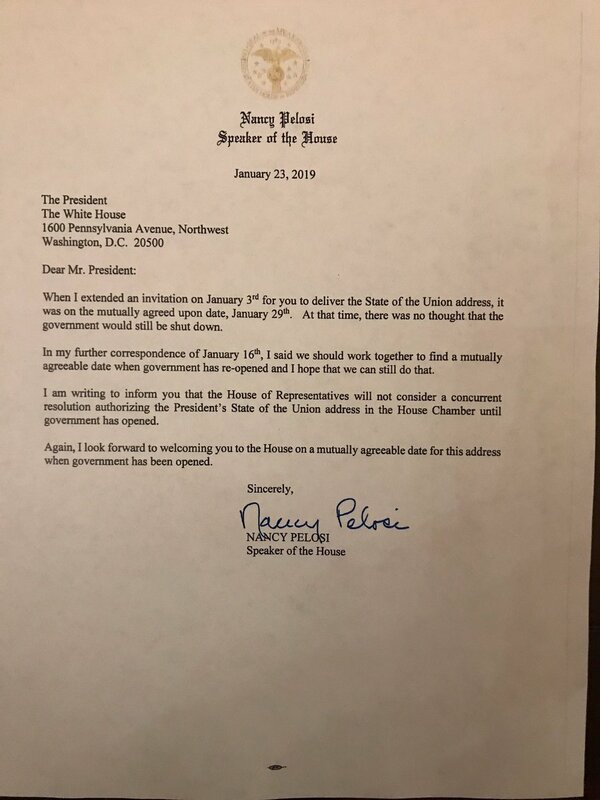 Since Nancy has declined his offer to give the SOTU at the original time and location, the White House has indicated that they have alternate plans for the SOTU. Expect some last minute antics from Nancy but don’t expect her to win. This will all come down on her like a ton of bricks, or wall slats. I voted for Candidate Trump and supported President Trump and I admire your wishful thinking but there are important issues to be considered here. The date of the State of the Union Speech was set for the 29th, which I for one think is important in this whole saga of obstruction by pelosi and the authority that any President has to give the State of the Union Speech at a time and place as originally designated which is meaningful, especially under the current circumstances. Today is the 24th, leaving only 4 days before the date of the 29th when the speech was originally scheduled, now a place and time has to be determined if this speech is not given on the 29th all the wishful thinking is just that wishful thinking, nancy pelosi won. Some have suggested that President Trump could give the speech in some kind of rally perhaps in Texas on another date, well in my view nancy pelosi wins. Remember over the past two years President Trump has given many speeches at many rallies and the only ones who cover it completely is FOX news. The other media outlets do not have to cover the State of the Union Speech if it is given in a political rally. President Trump and mitch mcconnell knew this day was coming and should have made arrangements to open the Senate for the speech. since the space in the senate is limited mcconnell could have invited the minority leader of the House, the Supreme Court Justices, the Cabinet, the Joint Chiefs of Staff and the families of those killed by illegal aliens. Since pelosi is speaking for the House no other members would be invited but the minority leader, a copy of the speech could be delivered to pelosi a few minutes prior to the speech. Just get rid of the sick democrats in DC. One way or the other. President Trump must give a state of the union speech on the 29th. maybe not name it THE STATE OF THE UNION but give it anyway in a place with American loving people, his cabinet, and other dignitaries. it is horrible what Nancy has done. does she think she is the only person in the USA? she has shunned the American people for her own political blindside. i hope the normal democrat voter wakes up and sees where this far left party is going. TRUMP NANCY, PRESIDENT TRUMP. Nancy Pelosi should go back to California where she belongs and stay there. Chuck Schumer does not even need to be in Washington, DC, period! Too many CROOKS in D.C.- America has enough Crooks, and Washington, D C just adds to the list. America would be just fine if everyone would just let President Trump do his job. President Trump and Vice President Mike Pence are two of the best that this Country has had in years, and I hope and pray they both will go back in office again. I concur. President Trump has left all of his options open. He can speak multiple times in multiple venues over the next week without calling it a SOTU address. Because he doesn’t the Speaker has left the door open for him to give an address after the shutdown and speak directly to the American people, from House Chambers, in front of recalcitrant Nancy et. al. and without the filters of the Mainstream Media to ignore his comments. President Trump plays Chess, Nancy only knows Checkers. Check Mate. Trump lost this one he was outsmarted by a woman. Little fingers screwedup again. I had a big old paragraph typed to respond to your comment. I deleted it. I realized it would be misunderstood, taken out of context and I would get unnecessary ridicule for voicing my opinion. I’ll just let your comment speak for itself. This is the most ridiculous situation , the people interest is completely ignored it does not matter what side you are supporting .It is all about ego ,politics , personal interest and in addition a load of stupidity . And all these individual are so wealthy they are representing a minority in this country and we people are allowing us to govern while they all make sure they stay wealthy. What a pity . We people should be able to stop this political circus , respect the Elected President in place , and vote to express yourself in 2020 . I am appalled at the attitude and behavior of Nancy Pelosi. Her lack of respect and her rude behavior are shameful. Even folks who are poor teach their children manners. She missed out on everything. What a great country we live in that someone as ignorant as she is can become speaker of the house. WHO AND THE SAM HILL, NANCY THINK SHE IS, THE THE HOUSE – HER HOUSE, THIS WITCH IS RUINING AMERICA!!!!! BOTH WITCH NANCY & CHUKCHI CHEESE ARE TWO BIGGEST BUT-HOLES, THAT HAD INVADE MY LIFE AND EVERY AMERICAN’S LIFE. WHO THINK BOTH OF THEM THINK THEIR CRAP DON’T SMELL!!! THOSE TWO FORGOT WHO THEIR BOSS REALLY ARE, AND THAT IS THE AMERICAN PEOPLE!!! THE DECLARATION – SAY’S (WE THE PEOPLE…) NOT US WITCH NANCY & CHUKCHI CHEESE, THESE TWO ARE THE BIGGEST DISAPPOINTMENT IN OUR ENTIRE AMERICAN HISTORY. BOTH WITCH NANCY & CHUKCHI CHEESE HAVE TURN A BLIND EYE TOWARDS THE AMERICAN PEOPLE, BY GIVING OUR HARD EARN TAX-MONEY TO FOREIGN COUNTRIES WHO WANT TO KILL AND DO-AWAY WITH THE AMERICAN PEOPLE & OUR COUNTRY, WE BOTH THINK SINCE THE SHUT DOWN THAT OUR MILITARY SHOULD GET PAID FOR DOING A JOB WE ASKED THE MILITARY TO DO EVERYDAY, BY KEEPING AMERICA SAFE! WE THINK THAT CONGRESS SHOULD NOT RECEIVE THEIR PAYCHECK INSTEAD, WE ARE SURE IF THAT HAPPEN THEY WOULD MEET AND AGREE ON SOMETHING WITH PT… ALSO RESTRICT THEIR TRAVELING PRIVILEGES. WE DON’T NEED WITCH NANCY TRAVELING THE WORLD ON OUR TAX-DOLLAR, WHAT WAS THE REAL REASON SHE WAS GOING TO DO IN AFGHANISTAN? GIVE AID TO OUR ENEMY! THEIR IS NO SUNNY BEACH OR RESORT FOR WITCH NANCY AND ALL THE OTHER CONGRESS PEOPLE AND THEIR FAMILY TO ENJOY. EVERY TIME SOMEONE IN CONGRESS OR EVEN THE SENATE WHO WANT TO TRAVEL TO A FOREIGN COUNTRY SHOULD BE APPROVE AND EXPLAIN TO THE AMERICAN PEOPLE THE PURPOSE OF THE TRAVEL. WITCH NANCY & CHUKCHI CHEESE, THINK THEY HAVE A OPEN ACCOUNT WITH AMERICAN PEOPLE BANK, WELL GUESS AGAIN, A LOT OF US ARE GETTING REALLY FED-UP, ON HOW TAX-DOLLAR IS BEING SPENT, WHY NOT HELP OUR VETERANS OUT, ALONG WITH AMERICAN’S LIVING IN THE STREETS, STOP GIVING WELL-FARE TO ILLEGALS & FOOD STAMPS, DID YOU KNOW A LOT OF US AMERICAN’S ARE DENIED WELL-FARE & FOOD-STAMPS BUT ILLEGALS WALK ACROSS OUR SOUTHERN BORDER AND HEAD STRAIGHT TO OUR WELL-FARE OFFICE’S AND GRANTED ALL THE BENEFITS, THIS MY FRIEND’S MUST STOP ASAP, A LOT OF AMERICAN’S ARE WELL BELOW THE POVERTY LEVEL, US INCLUDED, I’VE BEEN DENIED SO MANY TIMES MYSELF FOR A LITTLE HELP, YOU KNOW WHAT I’VE BEEN TOLD TO MY FACE, JOHN YOU DON’T QUALIFIED!!!! AND I WORKED VERY HARD IN MY WORK LIFE TO PUT THE MONEY INTO THESE BENEFIT’S!!! ON THE WALL, WALLS DO WORK, THEIR ARE SO MANY WALLS BUILT IN THE WORLD AND HAVE PROVEN THEIR WORTH ON PUTTING UP A WALL.!!! BOTH WITCH NANCY & CHUKCHI CHEESE, MUST BE BE REMOVED FROM OFFICE ASAP, WE THE PEOPLE ARE GETTING VERY SHORT TEMPER WITH THESE TWO, THEY BEEN IN OFFICE SO LONG THAT THEIR SCREWS ARE SO RUSTED THAT WD-40 WOULDN’T HELP. WE THE PEOPLE. ARE SO CLOSE OF TAKING THIS PROBLEM AND SETTLING THIS CRAP ONCE AND FOR ALL… IT’S COMING AND THE FIRST TO GO WILL BE WITCH NANCY & CHUKCHI CHEESE. OUR FEELINGS ON THE GOVERNMENT SHUT DOWN ARE WITH THE WE THE PEOPLE, WHY SHOULD GOVERNMENT EMPLOYEES NOT GET PAID, BUT YET CONGRESS IS GETTING PAID AND WANT TO TRAVEL PLACES WITH THEIR FAMILIES. THIS IS NOT RIGHT BY ANY MEANS WHAT SO EVER. WE ARE JUST TWO LITTLE VOICES OF WE THE PEOPLE, AND JUST THINK OUR VOICES CAN GET VERY LOUD, JUST LOOK BACK IN OUR AMERICAN HISTORY FOR THE PROOF. JUST BECAUSE PT IS NOT ONE OF THE THEM, WELL THIS IS WHAT AMERICA NEEDED, A BUSINESS PERSON TO RUN AMERICA, AMERICA NEEDS TO BE RUN AS A BUSINESS… FOOD FOR THOUGHT PT WILL NOT BE THE LAST BUSINESS PERSON WHO RUN FOR PRESIDENT AND WIN, THEIR WILL OTHERS VERY SOON, LIKE IT OR NOT THIS IS THE TRUTH. AMERICAN’S ARE GETTING VERY TIRED & SICK OF THE LIES AND THE RUMORS AND THE FAKE NEWS…. WE BOTH VOTED FOR PT FOR THAT REASON, AND WILL VOTE AGAIN FOR PT IN 2020. SO IF YOU DON’T LIKE WHAT IS WRITTEN HERE, TOUGH … AND WAKE UP AMERICA TIME FOR US TO SAY WHAT THE OUR GOVERNMENT SHOULD DO AND NOT TO DO. WE CAN START BY REMOVING CONGRESS PAYCHECK AND GIVE THE MONEY TO THE GOVERNMENT EMPLOYEES AND OUR GREAT MILITARY!!!! Nancy Pelosi and Chuck Schumer should both be impeached and removed from office – their agenda’s do not coincide with the wishes of the American People! I say we the people whose Taxes pay these idiots should gather together and decide to get these two out of office. In their personal vendetta’s against POTUS they are hurting the federal workers. I say personal because they won’t even consider anything that POTUS presents to them. If they’re not going to do their jobs – THEY should not be paid and they should certainly not be in office! Previous Previous post: Remember That Whole Fascism Topic? Next Next post: Are Democrats Using Federal Workers As Pawns?